Roasting the marshmellows, and burning the hog, while we sit back again for Question of the Week from Rob Zombie. This week Zombiehead Inc member CorpseReject has asked Rob a question about House of 1000 Corpses. Question: I absolutely love this movie. Every aspect of it….they way it was shot, the brilliant use of colors, the characters…and so on. My question is this…do you ever think that you may make another Firefly family movie possibly including a little of the family history? The entire dungeon, underground tunnels, Dr Satan’s operating rooms and the “patients” he worked on are something that I have wanted to see more of from the first time I saw the movie. The Professor, the Skunk Ape and his wife, the spirits in the house the Mother Firefly mentions…all of these seem like something that could make another awesome movie. You are the expert though I guess. Answer from Rob: I have been asked this question many times over the years, but right now there are no plans to revisit these characters. The way things are right now with the film business I highly doubt that a film like HOUSE OF 1000 CORPSES would ever get made today. Maybe as a cheap found footage film? I love the characters and have often toyed with the idea of trying to make another film, but nothing has ever come of it. I started writing a 3rd film but never finished it. In fact I wouldn’t be surprised if in the next five to ten years if I get an offer for someone to do a remake of 1000 Corpse. That would be weird. But seriously I think HOUSE OF 1000 CORPSES would make an awesome Broadway musical along the lines of Rocky Horror. So maybe that is where you will see more. LIVE ON STAGE! DR. SATAN SINGS! 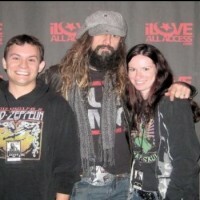 To put forward your own question for Rob Zombie to answer, go to the Forum and click on the first category Question of the Week – click New Topic and away you go – and remember BE ORIGINAL! And remember Rob doesn’t just pick one a week – he’s known in the witching hour to browse the forum and answer posts live so keep posting!